I don’t think that anyone can dispute that we are in a full-fledged energy crisis. Skyrocketing oil prices are endangering our economic security and standard of living. We have seen the immediate impact at the pump, but sharply higher prices on the way with every good and service in our economy since everything is dependant upon oil in some way. Do we need to conserve? Yes. Do we need more wind solutions? Absolutely. Do we need to look at solar energy? Of course. How about hybrid, electric, and hydrogen fuel cell cars? Duh. We must do everything in our power to attack this energy crisis. That includes drilling for the oil we are currently sitting on in this country. We are the only country in the world prohibiting itself from further development of its own natural resources. Drilling can be done without major environmental impacts and must be done to protect our national security. American Solutions is a non-partisan organization trying to rise above partisan politics to provide real solutions to our most significant problems. They are currently runing a petition drive demanding that our politicians remove the restrictions on domestic oil production for the sake of our economy and national security. I urge you to check them out and sign the petition if you are so inclined. I’m getting tired of the knuckleheads on Capitol Hill wasting time parading oil executives into hearing rooms to pummel them over profits every week rather than actually solving the problem. Isn’t this still America? Aren’t we still a capitalist nation? A quick lesson on the purpose of a business: to make money. Yes, it’s that simple. The purpose is no greater or less than that. We should be cheering their profits. Let’s say I were to grant you that a corporation could make “too much” money (I won’t, but let’s say I did). The oil industry has a profit margin well below the average of all industries. The reason for the huge profits in absolute numbers is simply the fact that it is the largest industry in the world. It would be like Joe’s Bar & Grill complaining that Applebee’s makes too much in comparison. The EPA just added polar bear to the protected list even though their numbers have increased substantially. Oh yeah, and the polar bears are in the same area where we need to drill for oil. They passed legislation allowing us to sue OPEC–I’m sure that won’t piss them off and cause them to cut off our oil. There have been rumblings of a windfall profits tax (even though I pointed out earlier that they are below average in their profit margins). Trust me, increasing a company’s expenses, will not lead to lower prices. All 3 presidential candidates have promised to pass cap and trade legislation (to fight the phantom global warming problem). The EPA estimates that this will increase the price of gasoline by $1.50 per gallon–other say it could be more like $5.00 per gallon. They have not allowed the construction of a new refinery in over 30 years. They will not allow the deployment of coal-to-oil technology. We are the Saudi Arabia of coal and could be energy independent with this technology. They won’t reduce the federal gas tax–not even for the summer. And they’re asking the oil executives why prices are so high? Stop the political grandstanding and provide real solutions folks. Gas Prices Headed Up Again? Well, strap yourselves in. It looks like gas prices may be headed steeply higher over the next several years. It would really save me some time if I could just have my paycheck direct-deposited into the oil companies’ bank accounts. I’ll have to check into the feasibility of that and get back with you. Meanwhile, reason #160 that this country is doomed: cheap cars in Asia. 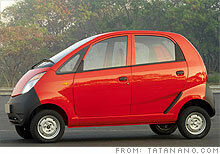 Indian automaker Tata has introduced a 2-cylinder, 4-passenger car that will retail for $2,500. With the rising incomes and the introduction of cheap cars like this, automobile ownership in Asia is expected to skyrocket over the next several years. There are 2 billion people in China and India compared to 300 million in the US. While these cars are extremely fuel efficient, the sheer number of new cars on the road will sharply increase demand for oil when supplies are already tight. But just look at the car. It’s a death trap. But hey, it will save on burial expenses. The car can easily double as a casket. They will be able to dig a hole and just place the car (with deceased occupants inside) in the grave. Apparently the Rose Garden Arena in Portland (home of my beloved Portland Trailblazers) is one of the last NBA arenas that has not sold naming rights. I just found out from John that this will not be the case starting with the 2008-2009 season. Yes, the beloved Rose Garden sign will be removed forever and replaced by the corporate logo of the highest bidder. I am really conflicted on this. The sentimental, near-life-long fan in me definitely does not want this to happen. The Rose Garden name has meaning; Nike Arena (or whatever it turns out to be) is meaningless. However, the capitalist in me says go for it and make every penny you can. That’s the American way. It’s not likely anything I or anyone else says will change their minds. I’m going to just give up and join in the cash bonanza. So this blog is announcing the sale of naming rights. I understand that the oil companies and Microsoft have lots of spare cash. Perhaps they’d be willing to throw some my way. As soon as the check clears, the Dad in the Headlights moniker will be removed forever and replaced by the winner’s company name and logo. Now Mr. CFO, you may not think that this would be a very good investment on your part. On the contrary; you need to be aware that this blog generates tens of hits per day. This will indeed be mutually-beneficial partnership. Make your bid today in the comments section. As soon as word got out, I’m sure there were some gas station owners rushing out to increase gas prices in anticipation. It could cause further erosion of consumer confidence, resulting in a pullback in consumer spending–pushing us closer to a recession. Happening the day before the Iowa caucus, it could have influenced some votes. Having said all that, oil went on to set a new high of $100.05 on Thursday–this time, “for real.” I just think it’s amusing (and sad) what people will do to get attention.